Includes a free preview of future issues in the collection Birth of our Nation . For more information, please refer to the Satisfaction Guarantee tab below. If you do not wish to preview future issues in the collection, you may purchase the single item using the 'Individual Item Only' tab at right. 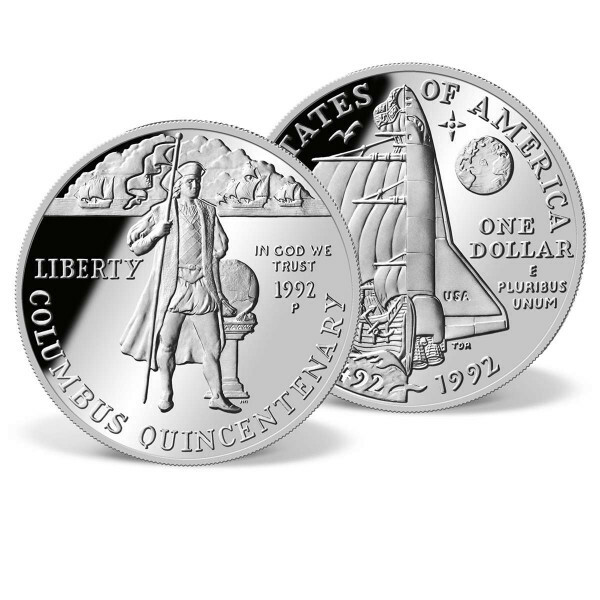 In 1992, the quincentenary, or 500th Anniversary, of Christopher Columbus' historic first voyage was celebrated with the official release of three commemorative coins from the U.S. Mint: a clad half-dollar, a silver dollar, and a $5 gold coin. These limited-edition coins were produced for only one year and in relatively small mintages. Arguably the most popular coin in the series, the silver dollar features exquisite art on both sides and is composed of 90% pure silver. The obverse shows Columbus standing proudly as he lays claim to the New World with his three ships at sea in thebackground. On the reverse is a split image of Columbus' main vessel the Santa Maria and the space shuttle Discovery, a nod to modern-day exploration.